The sprawling show, organized by Andrew Bolton and Harold Koda and on view through August 16, includes sections such as Saint Laurent & Opium, Perfume, Ming Furniture, Anna May Wong, Communist uniforms, Emperor to Citizen, Moon in the Water (Astor Garden), and Blue & White Porcelain. The latter is one of the more dramatic juxtapositions, placing a vase next to a curvy 2005 Robert Cavalli gown. 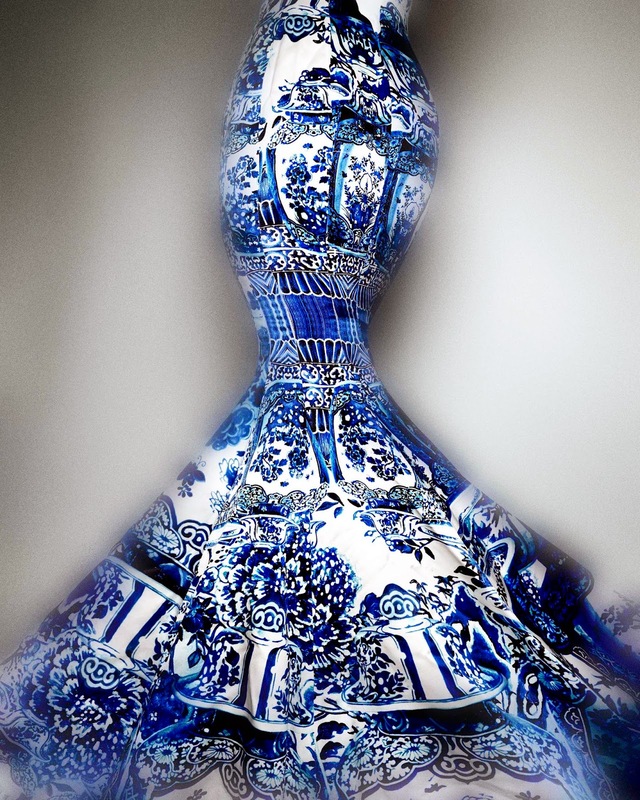 It also draws into the equation the tradition of blue and white porcelain in Northern Europe, an early example of borrowed stylistic cues. Filmmaker Wong Kar Wai is the exhibition's artistic director, and his romantic, elegant eye is evident throughout the extensive show. Clips of films by such directors as Zhang Yimou and Ang Lee are projected in select spots, providing a jarring modern, animated backdrop. The Astor Court houses a tribute to Chinese opera—stone floors are polished to a mirror finish, emulating reflective water; a moon is projected on the ceiling, but the lighting is too dark to clearly see the somewhat distant garments' details. More legible is the Imperial China gallery, featuring yellow and gold finery both ancient and modern. 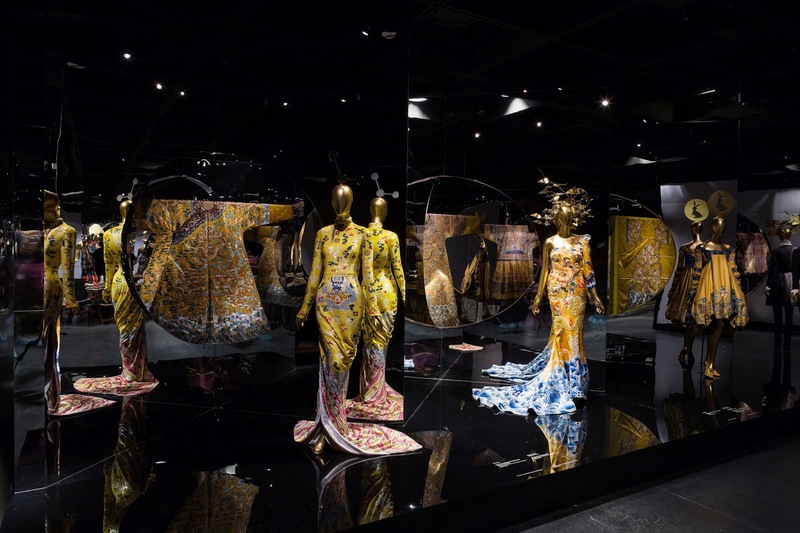 The Wuxia Gallery, with its magnificent, vast, early mural of Buddhist imagery, also contains the most modern installation—a forest of plexiglass rods, like giant fiber optics, amid which are situated Craig Green's neo-Mao outfits of quilted cotton, and Gaultier's futuristic silk damask getup with a laser headlamp. It's a lot of space to show a few mannequins, but such is the luxury of the Met's huge acreage. There are few castigations of crassness or decadence, in part because the Met is the grand dame of US museums. With these fashion shows, it walks the fine line between supporting the arts, and abject capitalistic decadence and celebrity worship and exhibitionism—apparently the perfect equation for raising money now.